Happy Hump Day! I don't know about you, but I'm anxious for the upcoming holiday weekend to get here. We're looking forward to enjoying the long weekend together and indulging in some summer fare. And with any holiday weekend, there's always some gathering happening somewhere. 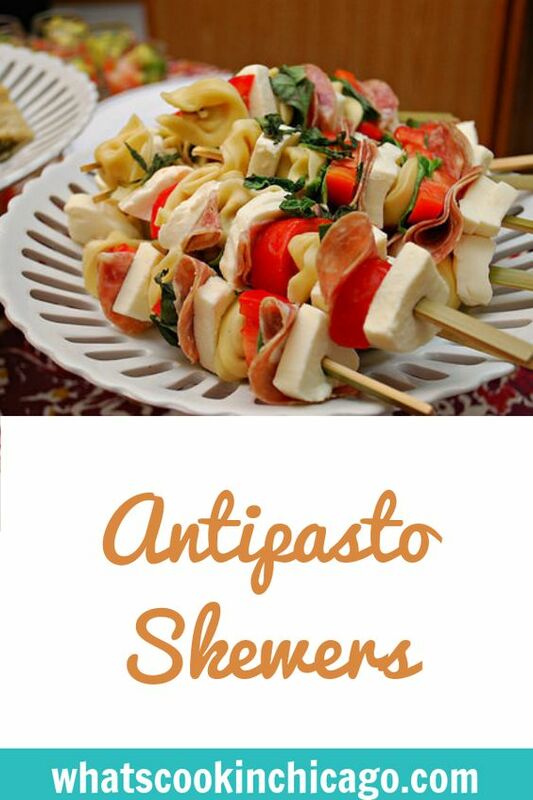 If you're either hosting or attending an Independence Day event, these Antipasto Skewers would be a nice addition to the table! Colorful, light and easy to make, you can make them quickly and not even bother with turning the oven or stovetop. These are even a great appetizer your little ones can help make. 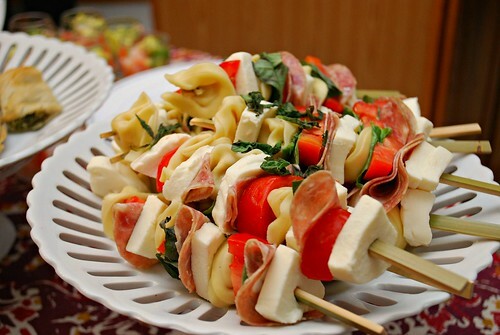 Layers of tomato, fresh mozzarella, basil leaves, salumi and cheese tortellini are skewered and enjoyed on a stick... because everything tastes better on a stick, right?! Why is it that skewers are all the rage in the summer months? It really should continue all throughout the year simply because it makes it so much easier to prepare and eat! I especially like this appetizer because I can cover all my fave food groups on a stick - dairy, vegetable/fruit, pasta, meat. Even better is that there are no dishes or utensils to wash! Cook the tortellini according to package directions; drain and set aside. Set up all the ingredients as an assembly line, taking account the color and shapes of each. Skewer the ingredients to your desired order. Place finished skewers on a serving platter. Drizzle with balsamic glaze and olive oil before serving.